Frank Viola. is a Master Club Technician, Certified Professional Club Fitter, and owner of Ace of Clubs in Saugus Massachusetts.With club making and fitting skills honed over a number years for thousands of happy golfers, Frank handcrafts golf clubs that fit your game. He believes that custom-fitted golf clubs made to your specifications will improve your performance whether you are a weekend warrior, an aspiring amateur or seasoned professional. Frank’s clients include golfers from around the nation and the world. Ace of Clubs is a 1,750 square foot state-of-the-art tech center, testing and fitting facility. The work shop is equipped for all golf club building and modifications. Frank personally fits and builds your clubs, He delivers the highest standard of professional service and build-quality in the golf industry. If you are in the New England area give him a call to schedule an appointment. If you are out of the area, call Frank to discuss your needs and determine the easiest way to build your clubs. 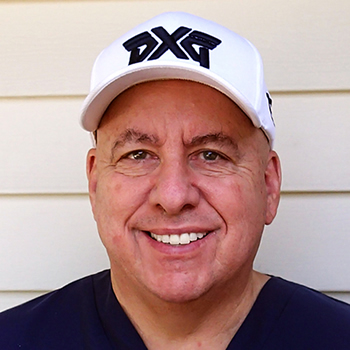 Frank has a passion for golf and will assisting you with discovering a greater love and enjoyment of the game with custom fit and built clubs. He believes that your pride in your game deserves clubs that fit you.